What are keratosis pilaris symptoms and signs? What types of doctors treat keratosis pilaris? How do doctors diagnose keratosis pilaris? What conditions mimic keratosis pilaris? What is the prognosis of patients with keratosis pilaris? Keratosis pilaris is a very common, benign skin disorder that affects adolescents and adults. Keratosis pilaris causes numerous small, rough, tan or red little bumps around hair follicles on the upper arms, thighs, buttocks, and cheeks. Keratosis pilaris creates the appearance of gooseflesh, goose bumps, or chicken skin. Keratosis pilaris may appear in patients with dry skin conditions and atopic dermatitis. Keratosis pilaris is not curable but spontaneously improves over time. People can inherit keratosis pilaris and is associated with a wide variety of other rare skin diseases. Keratosis pilaris generally requires ongoing maintenance therapy. Keratosis pilaris is a very common skin disorder that affects people of all ages. Keratosis pilaris is a benign condition characterized by numerous small, rough, red, or tan bumps primarily around hair follicles on the upper arms, legs, buttocks, and sometimes cheeks. Keratosis pilaris creates a "goose bumps," "gooseflesh," or "chicken skin" appearance. Keratosis pilaris may be cosmetically displeasing, but it is medically entirely harmless. Keratosis pilaris is common in otherwise healthy people. Anyone can have keratosis pilaris. Although it is commonly a skin condition of children and adolescents, many adults also have keratosis pilaris. Females seem to get keratosis pilaris more often than males. The age of onset is often within the first 10 years of life and may worsen during puberty. However, keratosis pilaris may begin at any age. There seems to be a genetic aspect to keratosis pilaris. It has been commonly been seen in twins. Keratosis pilaris also appears in patients with atopic dermatitis and patients with very dry skin and with a variety of rather rare dermatologic syndromes. Recently, medical professionals have observed that certain drugs produce a skin change indistinguishable from keratosis pilaris aside from the fact that it will resolve when the drug is stopped. These drugs include cyclosporin, B-raf inhibitors (for example, dabrafenib), and tyrosine kinase inhibitors (for example, nilotinib). People often describe localized swollen areas on, or under, the skin as lumps or bumps. While bumps on, or under, the skin may result from conditions that give rise to a skin rash, many other conditions can result in solitary raised lumps on the skin. It is rare to have keratosis pilaris all over the body. The lesions in keratosis pilaris most characteristically involve the back of the upper arms. Other common locations include the back, thighs, buttocks and occasionally the face. It does not affect the eyes, mouth, palms, or soles. The exact cause of keratosis pilaris is unknown. There seems to be a problem with overproduction of the keratin part of the skin producing hyperkeratinization. Others believe that there may be some defect in hair formation, producing defective sebaceous glands, which might partially explain its physical association with hair follicles. A majority of patients with keratosis pilaris has a known genetic predisposition and affected family members. Keratosis pilaris can be present with ichthyosis vulgaris, dry skin, seasonal inhalant allergies (hay fever), rhinitis, asthma, eczema, and atopic dermatitis. The bumps in keratosis pilaris seem to arise from the excessive accumulation of keratin from the superficial layer of skin at individual hair follicles. The skin as examined under the microscope demonstrates mild thickening and perforation of the hair follicle. The upper skin layers may have some dilation of the small superficial blood vessels, thereby giving the skin a red or flushed appearance. Typically, keratosis pilaris patients present with a scattered, patchy rash composed of very small red or tan bumps. Anywhere from 10 to hundreds of very small slightly rough bumps produce a fine sandpaper-like texture. Some of the bumps may be slightly red or have an accompanying light-red halo indicating inflammation. Sometimes, a small, coiled hair gets trapped beneath the rough bump. Patients may complain of a rough texture and an irregular cosmetic appearance of the skin. The cheeks may appear pink, red, flushed, and studded with very small (pinpoint) bumps. Keratosis pilaris may cause bumps on the backs of the upper arms, as seen here. Most family physicians and pediatricians are able to diagnose and treat this condition. Occasionally, a dermatologist referral may be necessary. The diagnosis of keratosis pilaris is very straightforward and based on a typical skin appearance in areas like the upper arms. A family history of keratosis pilaris is also very helpful since there is a strong genetic component to the condition. A physician's clinical exam confirms the diagnosis. In late-onset keratosis pilaris occurring in adulthood, one needs to consider a drug as a possible cause. Are there any lab tests to help diagnose keratosis pilaris? Since the appearance of keratosis pilaris is recognizable, specific laboratory tests are not needed for the diagnosis. Skin biopsy (surgically taking a small piece of skin using local numbing medicine) may be useful in atypical or widespread cases. What does keratosis pilaris look like under the microscope? Histopathology or pathology are terms for microscopic examination of the body tissue under high magnification by a pathologist or dermatopathologist. Histopathology of keratosis pilaris shows modest thickening of the outer layer of skin (hyperkeratosis of the stratum corneum), increase in the granular cells of the epidermis (hypergranulosis), and plugging of individual hair follicles. The upper dermis (layer of the skin below the epidermis) may have some microscopic inflammation called mild superficial perivascular lymphocytic inflammatory changes. Diet does not affect keratosis pilaris. Vitamin A deficiency may cause symptoms similar to keratosis pilaris, but it's not known to cause keratosis pilaris. There is no available cure, miracle pill, or universally effective treatment for keratosis pilaris. It sometimes clears completely by itself without treatment. Keratosis pilaris is not contagious. People do not give it to someone else through skin contact and do not catch it from anyone else. Some people are simply more prone to developing keratosis pilaris because of genetics and skin type. Other medical conditions can mimic keratosis pilaris. Keratosis pilaris may resemble acne, milia, folliculitis, eczema, atopic dermatitis, facial rosacea, or dry skin (xerosis). Keratosis pilaris may also resemble uncommon skin conditions like lichen spinulosus, pityriasis rubra pilaris, phrynoderma (vitamin A deficiency), ulerythema ophryogenes, ichthyosis vulgaris, eruptive vellus hair cysts, keratosis follicularis (Darier disease), Kyrle disease, lichen nitidus, lichen spinulosus, perforating folliculitis, and trichostasis spinulosa. In India and other countries, a specific condition called erythromelanosis follicularis faciei et colli occurs. This unusual condition has a possible genetic relationship to keratosis pilaris. 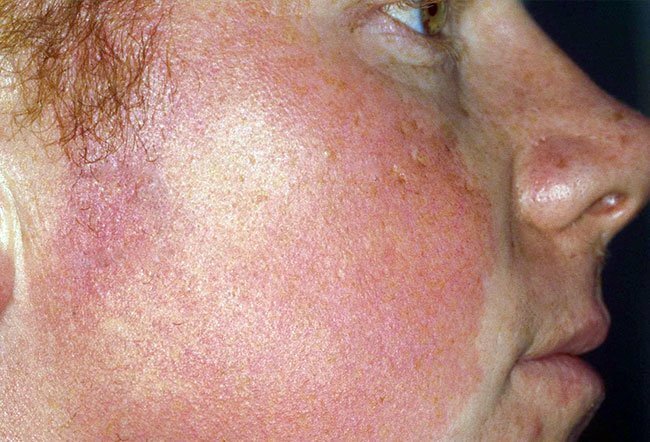 Erythromelanosis follicularis faciei et colli is characterized by the triad of hyperpigmentation (darker skin color), follicular plugging (blocked hair follicles), and redness of the face and neck. Do take measures to prevent excessive skin dryness, especially in colder winter months. Do use mild soaps like Dove soapless cleanser or Cetaphil cleanser. Do lubricate skin with special lotions containing ammonium lactate such as AmLactin or Lac-Hydrin lotion, alpha-hydroxy-acid lotions (glycolic acid), urea cream (Urix 40), and salicylic acid (Salex). Do gently massage the lotions into the affected area twice a day. Don't use harsh soaps or cleansers. Don't scrub harshly and try to scrape off the skin. Don't expect immediate results with topical creams. Many treatment options and skin care recipes are available for controlling keratosis pilaris. Often there is very good temporary improvement following a regular skin care program of lubrication. As a general rule of thumb, treatment needs to be continuous. Since there is no available cure or universally effective treatment for keratosis pilaris, the list of potential lotions and creams is long. It is important to keep in mind that as with any condition, no therapy is uniformly effective in all people. Complete clearing may not be possible. In some cases, keratosis pilaris may also improve or clear spontaneously without any treatment. Health care providers recommend general measures to prevent excessive skin dryness, such as using mild soapless cleansers. Frequent skin lubrication is the mainstay of treatment for nearly all cases. Basic over-the-counter moisturizers such as Cetaphil lotion or Aquaphor ointment may improve mild cases of keratosis pilaris. Additional available therapeutic options for more difficult cases of keratosis pilaris include lactic-acid lotions (AmLactin, Lac-Hydrin), alpha-hydroxy-acid lotions (Glytone, glycolic body lotions), urea cream (Carmol 10, Carmol 20, Carmol 40, Urix 40), salicylic acid (Salex lotion), topical tretinoin cream (Retin A), and topical steroid creams (triamcinolone 0.1%). Recently, medical professionals have recommended laser treatment for keratosis pilaris. New unproven treatments include topical chlorine dioxide complex wash, ammonia-oxidizing bacteria (Nitrosomonas eutropha) spray on mist, and photopneumatic therapy. People have tried many treatments for keratosis pilaris, including carbon dioxide laser with mixed results. As there is no miraculous cure or universally effective treatment for keratosis pilaris, it is important to proceed with caution. Rarely, physicians may prescribe a short seven- to 10-day course of a medium-potency, emollient-based topical steroid cream once or twice a day for itchy, inflamed red areas. Because keratosis pilaris is generally a chronic condition requiring long-term maintenance, most therapies would require repeated or long-term use for optimum results. Mild cleansers and lotions for sensitive skin: Wash daily, and apply lotion twice a day. Potent moisturizers for home treatment: Use once or twice a day. Complications are infrequent since it's primarily a cosmetic skin condition. However, temporary skin discoloration called post-inflammatory hypopigmentation (lighter than the regular skin color) or hyperpigmentation may occur after the inflamed, red bumps have improved or after a temporary flare. Permanent scarring may rarely occur from picking, overly aggressive treatments, or other inflammation. Overall, keratosis pilaris is a chronic skin condition periodically becoming worse or better. Keratosis pilaris is a benign, noncontagious, self-limited skin condition that tends to be mild. Keratosis pilaris frequently improves with age in many patients. Many patients note improvement of their symptoms in the summer months and seasonal flares in colder winter months. Keratosis seems to improve in areas of high humidity. More widespread, atypical cases of keratosis pilaris may be cosmetically distressing. Will I eventually outgrow keratosis pilaris? Keratosis pilaris usually improves with increasing age. Keratosis pilaris may even spontaneously clear completely after puberty. However, more frequently the condition is chronic with periodic exacerbations and improvements. Many adults still have the skin condition into their 40s and 50s. Hwang, Sharon, and Robert A. Schwartz. "Keratosis Pilaris: A Common Follicular Hyperkeratosis." Pediatric Dermatology 82 Sept. 2008: 177-180. Kootiratrakarn, Tanawatt, Kowit Kampirapap, and Chakkrapong Chunhasewee. "Epidermal Permeability Barrier in the Treatment of Keratosis Pilaris." Dermatology Research and Practice 2015 Feb. 12, 2015: 1-5. Thomas, Mary, and Uday Sharadchandra Khopkar. "Keratosis Pilaris Revisited: Is It More Than Just a Follicular Keratosis?" Int J Trichology 4.4. Oct.-Dec. 2012: 255-258. Wang, Jason F., and Seth J. Orlow. "Keratosis Pilaris and its Subtypes: Associations, New Molecular and Pharmacologic Etiologies, and Therapeutic Options." American Journal of Clinical Dermatology 19 (2018): 733-757. Zirwas, Matthew J., and Jill Fichtel. "Chlorine Dioxide Complex Cleanser: A New Agent With Rapid Efficacy for Keratosis Pilaris." Journal of Drugs in Dermatology 17.5 May 2018. What was the cause of your keratosis pilaris? Please describe your experience with keratosis pilaris (KP). What was the treatment for your keratosis pilaris? Where on your body do you have keratosis pilaris? Have you found an effective treatment? Keratosis pilaris atrophicans (KPA) is a group of inherited disorders with three subtypes including (a) keratosis pilaris atrophicans faciei (KPAF), (b) atrophoderma vermiculatum (AV), and (c) keratosis follicularis spinulosa decalvans (KFSD). KPAF and AV present mainly on the face with KFSD often appearing on the eyebrow and AV most commonly seen on the cheeks, sparing the eyebrows and scalp. KFSD can affect the face, scalp, and trunk. Inheritance pattern can be autosomal dominant (KPAF, AV), recessive (AV), or X-linked (KFSD). Here, a patient is emotionally bothered by persistent erythema from keratosis pilaris atrophicans. Microdermabrasion is a skin-exfoliating treatment that may improve the condition of acne scars and fine wrinkles. Skin should feel softer and smoother after microdermabrasion. Side effects may include skin tightness, redness, fine broken blood vessels, and minor bruising.